This compact tool is versatile for punching holes and setting rivets. It comes with a set of 1/16 inch punch and rivet tools. 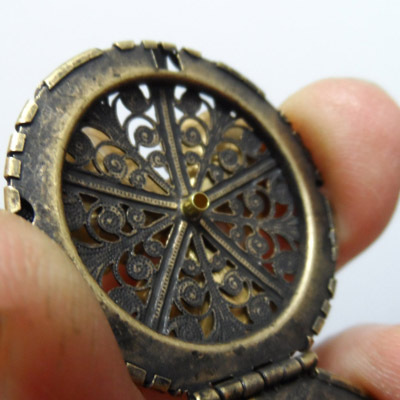 This is a perfect size for jump rings and wire work as well as tiny rivets. 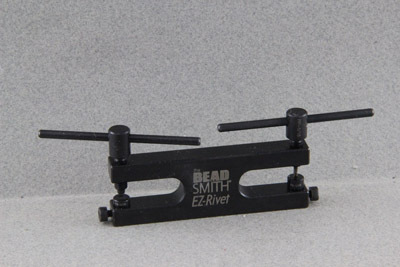 For more robust connections on B’sues predrilled products; a second set with 3/32 inch size is available. 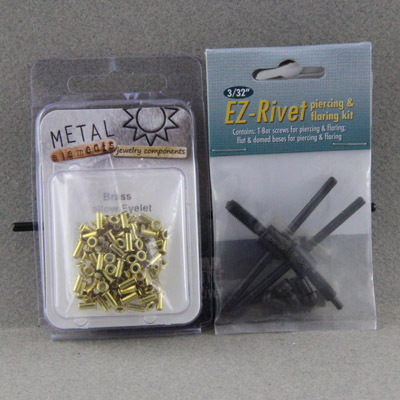 Tube rivets and grommets from several sources work with this tool. Be sure to change both the top and bottom parts when changing size. They are all labeled. 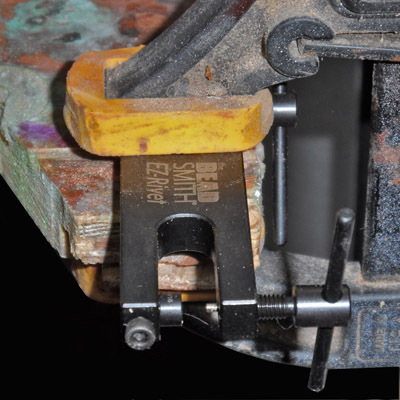 The most efficient way to use this tool is to clamp it to your work surface with half of the frame over the edge. 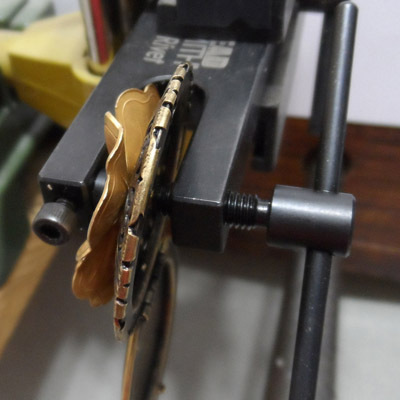 This allows you to bring the metal to the punch and comfortably punch and rivet. 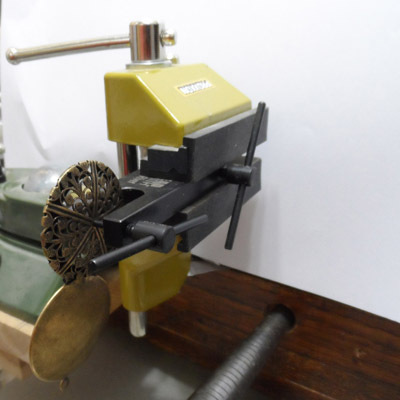 I use a vise to hold the tool and have placed a locket in place to punch the mounting hole for a flower. With the piece in place the T-handle is tightened until the hole is made and then turned back to release the metal piece. The result is a clean smooth hole. 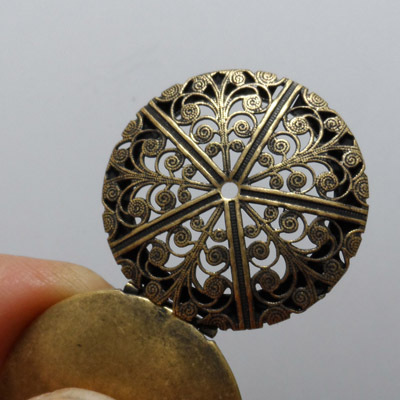 It is ready to insert a tube rivet through the flower and into the cover of the locket. 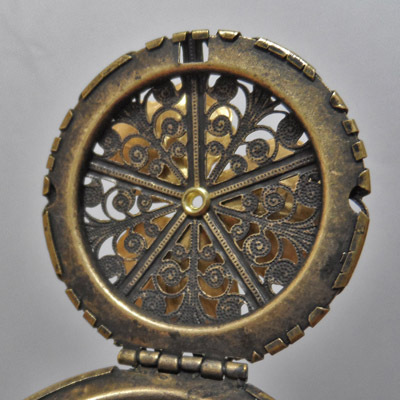 The tube rivet extends through the opening only a short distance. We then turn the tool over to access the riveting end. Re-clamp the tool to the table. Place the head of the rivet against the base and tighten the T-handle to flare the rivet. The finished rivet is clean and attractive. 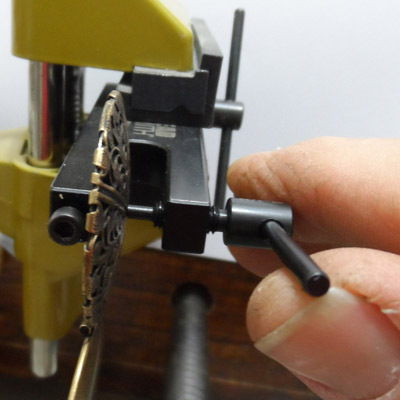 You can control the tightness of the join so you are able to have the pieces free to turn or not as you wish. Visit www.oscarcrow.blogspot.com for further discussions on specific issues in metalworking and bench work.